Last week we showed you IKD customer Sharon’s stunning modern farmhouse kitchen. But, we also designed her laundry room and master bathroom using IKEA kitchen cabinets, too. IKD designs IKEA kitchens, but we are also in the business of doing these rooms too. Today we’ll show you Sharon’s laundry room and master bathroom. Mudroom storage doesn’t get much attention from designers or homeowners. This space just inside the door serves as a hard-working organization station. It can’t be neglected! A mudroom is a room which is built into some houses to act as a barrier between outdoors and indoors. 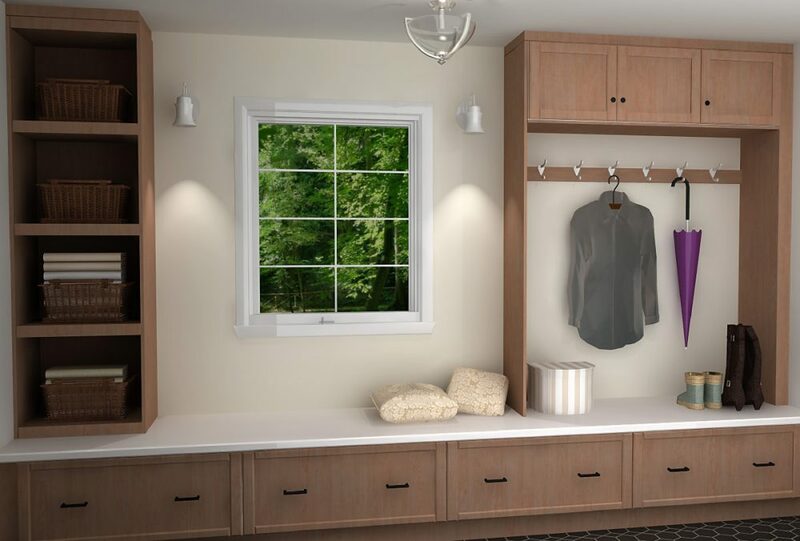 Especially in regions with wet, muddy winters, mudroom storage can be a useful addition as it helps to keep the house clean. The improvised mudroom storage was a space for shoes and junk.